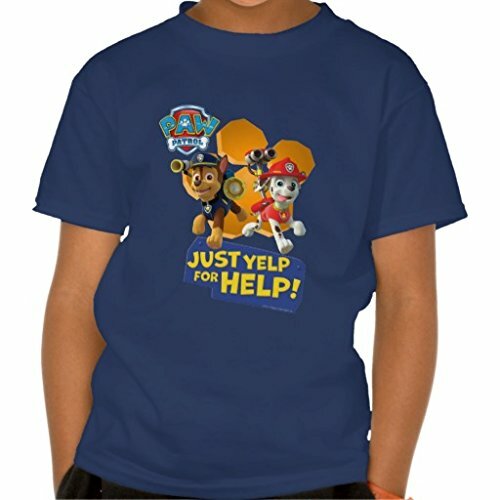 If you have a Paw Patrol in your life, then you know how hard it is to find these toys and the clothing for the show in stores. It seems like as soon as they hit store shelves, they are being snatched off and sold. When you see this, you know it is a must have toy -- just makes it more difficult for Santa to fulfill all the little boys and girls' wish lists for these toys. Fans of the show will have a blast painting the coloring and activity pages of this book, which is filled with fun shots and scenes featuring all their favorite pups. LED light up canvas -- yes, it really lights up. This is on Savannah's wish list. 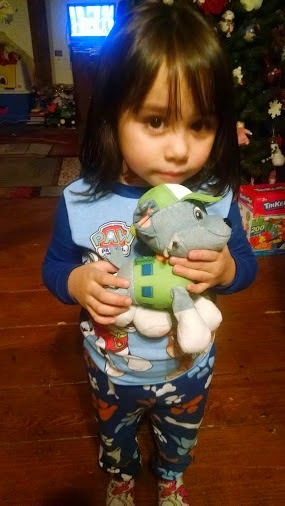 Savannah was so excited recently when we were sent the 2-piece cotton Paw Patrol pajamas from the folks at Nickelodeon. Even though it was only mid afternoon, she was quick to peel off her clothes just so she could try on her new Paw Patrol pajamas. Once on, she was ready to pose for the camera with and without her Paw Patrol plush collection, including her favorite Rocky. Can you believe that these pajamas are only $6.44 at Walmart. If you can find them, they are steal. 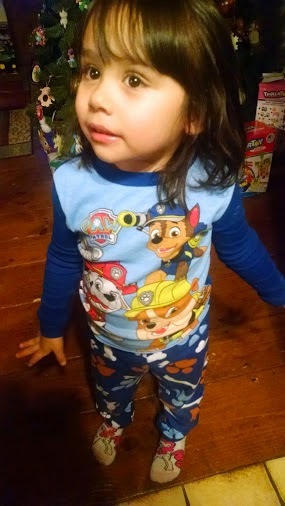 Shh, don't tell anyone, but right now I have been finding these and other Paw Patrol pajamas -- the footed ones and fleece top and bottoms through Walmart.com and having them shipped to me. Instead of stopping by my local Walmart to see if the shelves have been stocked with new Paw Patrol inventory, I am finding I have better luck ordering online and having the items for under the tree shipped to me. No long lines or disappoint coming home empty handed. In addition to being sent the pajamas, I was also sent this cute Paw Patrol coloring and activity book with jumbo crayons, which Savannah ended up coloring and completing the activities from cover to cover in one day's time. Now her bedroom walls and our refrigerator are covered with her works of art she colored and ripped out from this book, which is only $3.99 and found at Walmart, as well as through Amazon.com. I know that on Christmas morning, my little Paw Patrol fan is going to go crazy for all the Paw Patrol toys and clothes Santa left for her. I am just hoping that they start coming out with more clothes geared towards girls. I keep picking up shirts from the boys section, and most don't have Skye, the girl pup. Maybe with the new addition of Everest, we will be seeing more girl-oriented Paw Patrol toys.